Taper of waist with shape of magic might. And ruby on her cheeks reflects his light. Beware of curls that bite with viper bite! Mere rock behind that surface 'scapes our sight. Shafts that at furthest range on mark alight." OK, the "ruby cheeks" bit doesn't quite work for Zade, who has furry white cheeks on her motley face, and she doesn't wear fringed curtains over her greenish eyne, but the rest of it is accurate. 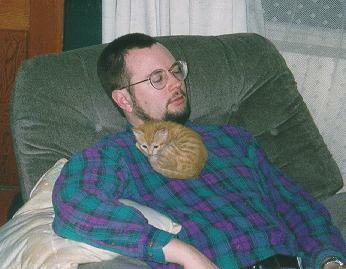 She joined us on January 30th, 1997, about seven months old. Hobbies: sleeping, eating, sleeping, ambushing Tobit, exploring the basement, sleeping, watching squirrels, grooming, stealing AA batteries, sleeping. Any pencil, pen, or battery which may be pushed off a table will be. Is especially lively when: licking tuna cans, chasing peacock feathers, hunting bugs. Especially responds to: whistling, tin whistle, recorder music, singing in the treble clef range. She sings along. Favorite food after tuna: blue cheese crumbles. Single most descriptive word: regal. For contradictory accounts of what happened to the original Scheherazade after night #1001, see either the Poe version or the Chanel version [French | English]. Weird wild stuff. No, she's not lying down and lazy all the time (even though she treats herself like a princess). When she's hunting bugs, for example, she's all over the place. And she and Rogan are a deadly team as mousers. Zade loves to have her back scratched. She nibbles on toes to make sure the scratching continues. Tobit joined us the evening of October 1st, 1997, at the beginning of Rosh Hashanah, but that's merely a coincidence and probably irrelevant. He was born in approximately the last week of May, making him about a year younger than Zade. She needed a challenging, boisterous playmate. 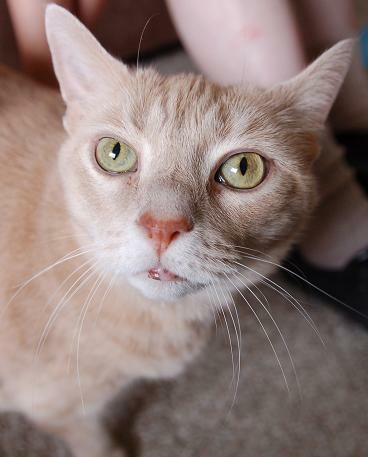 Toby is a very long beige guy with brown eyes, looking sort of like the famous Morris. He also looks sort of like Daniel Striped Tiger from Mister Rogers' Neighborhood, but is less shy. Tobit is of course also a Middle Eastern literary character. Unlike that one, ours hasn't had to deal with bird dung. We suspect that his second or third names might have something to do with Gilligan, on account of his personality, but we're not sure yet. Hobbies: sleeping, eating, "Clash of the Titans" wrestling matches, romping, sleeping, wanting to be inside when he's out, wanting to be outside when he's in, standing by the refrigerator saying "Got milk? Got milk? ", eating, sleeping. Is especially lively when: playing ping-pong ball soccer, begging to have egg and/or milk added to his dry food, playing with rubber bands and crickets. Especially responds to: flashlight on the wall, harpsichord music. The flashlight game makes him chirp (like the high three-note patterns halfway through Debussy's "Golliwogg's Cakewalk") and induces five-foot vertical leaps against the wall. Favorite food after tuna: licking an ice cream bowl where the flavor was Javachip. Single most descriptive word: recumbent. Tobit had a bad experience in summer 1999 being treed by some stray pigs; this has tempered his personality quite a bit. He is still especially wary of any creatures that might be in his space. When Tobit is not selfishly pushing Zade off her chairs or leaping at her, he snuggles up and purrs, and she obligingly washes his face and ears. Rogan has learned this well from Tobit, and now collects more attention from Zade than Tobit does. Tobit is our talker. He also likes to ride around on Gloria's shoulders. 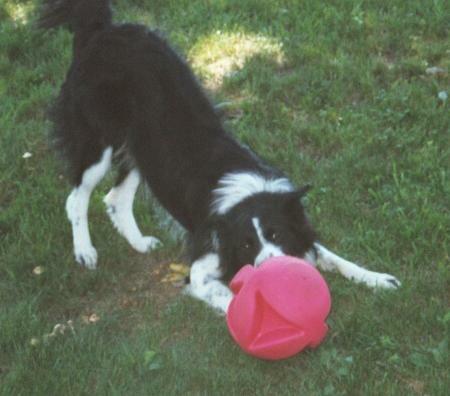 Tobit died on Mother's Day, Sunday, May 8, 2011. He had seemed good all week, still climbing onto us and purring as we sat on the sofas. He was overweight, a big chunk of a cat. In his last years he often kept to himself, but he was still friendly, and came around at least once a day for some petting. On the evening of Saturday the 7th he hid in a closet, but we were not worried about him. At about 5:30 in the morning of the 8th, though, he woke us up with some yowling, as if in pain. We all went back to sleep, but he cried a few more times. At about 7:30 we took him out to the kitchen and gave him some fresh water, but he did not take any. He just crouched down, as if he could not move his muscles. After about 15 minutes, he hobbled over to the next room and crouched again, breathing shallowly. We called to make a vet appointment. After a while, he rolled over onto his side with his mouth open, and did not respond well after that: just twitching. We carefully got him into the van, and we all went to the vet. By the time we got there, Tobit was barely breathing, and still twitching. At the exam table, the doctor said that he had liver failure, and was probably not going to live. We decided that he was never going to get better, and we had to say goodbye. We all cried together. Tobit closed his eyes, and did not see us as we left. We are glad that he never had to suffer a whole day, being sick. He had always had good health. We'll try to find some more photos of him. He still looked almost the same as in the 2005 photo. He was a nice kitty, and we will miss him. Helping to write this Tobituary, Afton cannot believe that Tobit was ever a five-foot jumper. But, he was. That thing with the pigs in 1999 really did change him. He hardly ever went outdoors anymore after 1999, and he didn't get much exercise. He was still the talker, but didn't go for much action. Zade and Tobit needed a playmate. 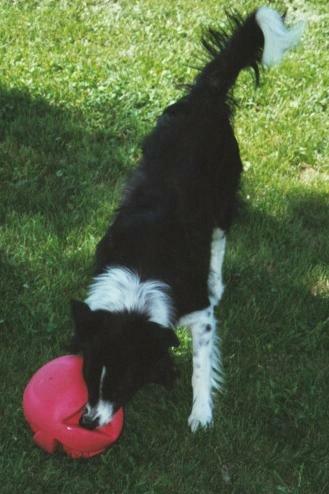 Rogan joined us the evening of April 23, 1999. He was born near the end of February 1999. Rogan is a red-haired little friskball. We picked the name from a book of Celtic names, and it means "red-headed." Then we learned that this too is a legendary figure, and "Rogan Josh" is an Indian entree. Hobbies: romping, eating, ambushing Zade and Tobit, eating, starting "Clash of the Titans" wrestling matches, chasing a toy mouse on a fishing pole (he does back-flips), shredding any plastic bag or heavy paper in sight, sleeping. He gets a lot of mileage out of the word "meeep". 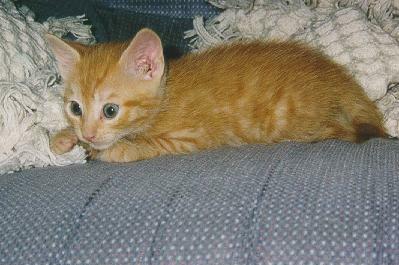 If a glass of water is ever left en prise near the floor, even for five minutes, it will be knocked over so he can play in it. Is especially lively when: pursuing a toy or live mouse, or playing with paper. Sometimes he leaps vertically from a lying-down position on the kitchen floor; we suspect he has demons. He also seems to think he is a dog: he goes along with us on walks to the woods. Favorite food: anything. Favorite drink: water directly from the faucet (or more generally, any water that can be made to move). Single most descriptive word: elfin. 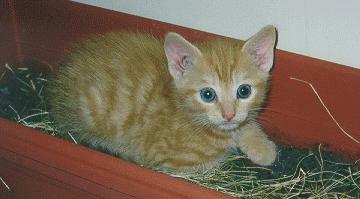 He is now much bigger than the photos indicate, and his eyes have changed from blue to brown. He gets so much exercise from running around outside (for hours) that he never gets much over ten pounds. He's developed some cute freckles on his nose, and a few of his whiskers are black. Scooter's human, Gloria's brother Wes, turned Scooter over to us when he (Wes) got married. There was some biting for a while, but that has ceased when Scooter got accustomed to present company. Hobbies: ambushing Rogan; lying exactly in the middle of the floor where humans were planning to walk or trying to work. Is especially lively when: lying on top of a sofa to lick the back of a human's head. Favorite food: anything. Favorite drink: water; he's easy to please. Single most descriptive word: purry. Scooter died on November 15th, 2007. In his last half year he developed some health problems and lost half his weight. Here is one of the best memories of him from March 2007. Fianna (pronounced "Feena") joined us the evening of December 13, 2001. She was born eight weeks earlier on October 13. 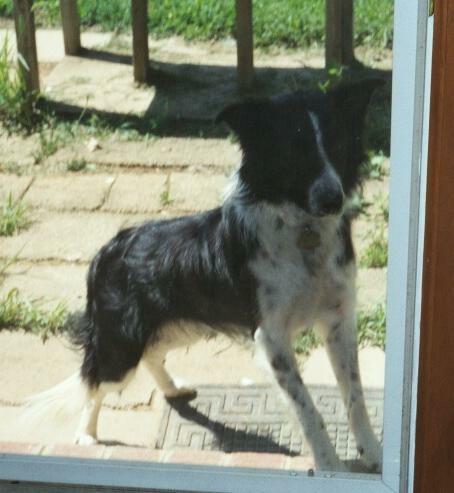 She is a purebred Border Collie. Her parents' names are Rose and Bud. Hobbies: chasing anything we throw, playing soccer, gnawing anything we give her, going on walks across the fields or to the woods, looking at us and the cats through the glass door. She and Zade spend quite a bit of time nose to nose through the glass. Is especially lively when: awake. Favorite treat: Meow Mix! Single most descriptive word: vigorous.